Handle increased traffic from development along Jarmans Gap area. Improvements will take place in the 1.5 mile stretch between the intersection of Crozet Avenue (Virginia State Route 240) and just east of Lane Town Road (Rt. 684). Improvements include sidewalks and bike lanes from Route 240 to the Grayrock neighborhood and a widened shoulder on the remainder. 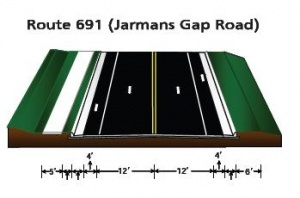 The Jarmans Gap Road improvements are a long-planned set of improvements to widen Jarmans Gap Road, the major east-west thoroughfare in Crozet, including the addition of bike lanes and sidewalks. The project was advertised for construction bids in January 2011 and construction began in May. The road's intersection with Route 240 (Crozet Avenue) was closed for five weeks beginning on September 15, 2010 for utility relocation. ↑ Web. VDOT dashboard entry for project, December 6, 2010, December 6, 2010, retrieved December 6, 2010. ↑ 2.0 2.1 2.2 Web. Jarmans Gap to close for 60 days, Daily Progress, World Media Enterprises, May 17, 2011, retrieved May 17, 2011. ↑ Web. MPO begins rewriting long-range transportation plan, Sean Tubbs, Charlottesville Tomorrow, Charlottesville, VA, January 27, 2011, retrieved February 1, 2011. ↑ 4.0 4.1 Web. Construction Now In Progress on Jarmans Gap Road, Lou Hatter, VDOT Newsroom, VDOT, Culpepper, May 16, 2011, retrieved May 18, 2011. ↑ Web. Crozet Master Plan, Chapter 3, Albemarle County, October 13, 2010, retrieved October 18, 2010. ↑ 6.0 6.1 Web. Jarmans Gap project comes under scrutiny, Frank Muraca, Charlottesville Tomorrow, August 9, 2011, retrieved August 9, 2011. ↑ Web. Closure of Jarmans Gap Road Moved to August 29, County of Albemarle, retrieved August 23, 2011. This page was last edited on 4 December 2013, at 16:01.